If you are a photo fan, this application can help you. This application allows you to arrange pictures of the same event, but that were made with different photo cameras. The idea of this application has started from my need of merging pictures of the same event but from different camera sources. Usually, when we participate to a party, event or other meeting with our friends, we make a lot of pictures. Our friends make pictures with their photo camera, too. Finally we collect in our computer all the photos (friend’s photos and our photos, too). Usually, I create a folder with the pictures of every friend. Unfortunately, each camera has own prefix and index file name. So, even if we should put all the pictures in one folder, I cannot see the pictures in the same order as the pictures has made. Otherwise, when we look over the pictures, we see only one friend’s picture session. We are unable to view pictures in order of their creation. Simple Pictures Unifiers application comes to help you. The application extracts the picture internal creation time and allows you to order files after a new name, according to this criteria (creation time). (Add Files… or Browse for Folder option). Before starting the sort and the export process, you have to adjust some the new file prefix and file name start index and the folder path location. Additionally, maybe you would prefer to change some files order (adding before / after other pictures) in your result files. 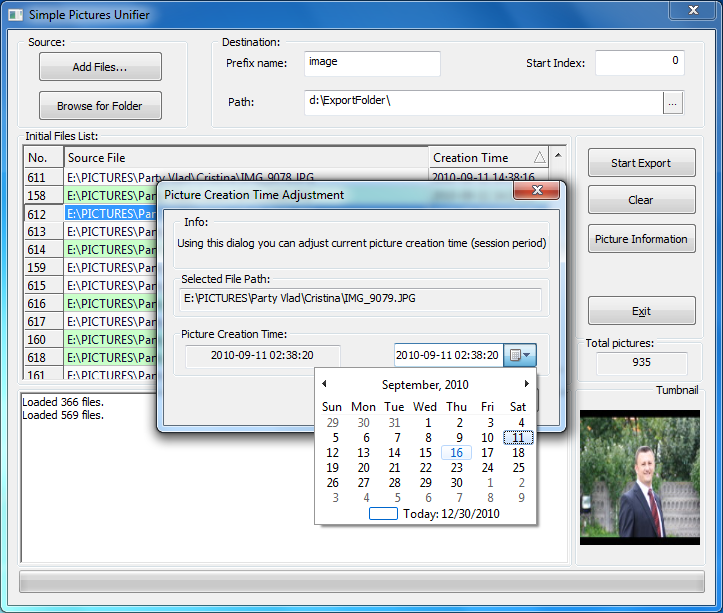 For this idea you can adjust the creation time for current application session using Pictures Creation Time Adjustment dialog ( right-click on a file from Initial Files List and select Picture Creation Time Adjustment menu option ). Whenever you need you can remove from initial files list any file you need using Delete key or right click popup menu Delete option (this is a soft remove – from current application session). You can get more internal picture details using Picture Information feature. 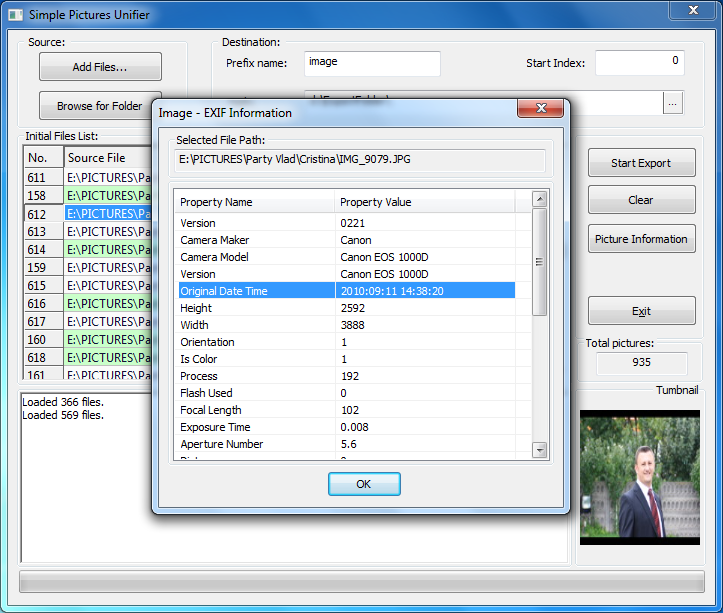 From the initial files list, select a file and use mouse right click and select Picture Information (EXIF) option. When you think that you added all the files that you need and you made the needed time adjustment, you can start the effective export process. 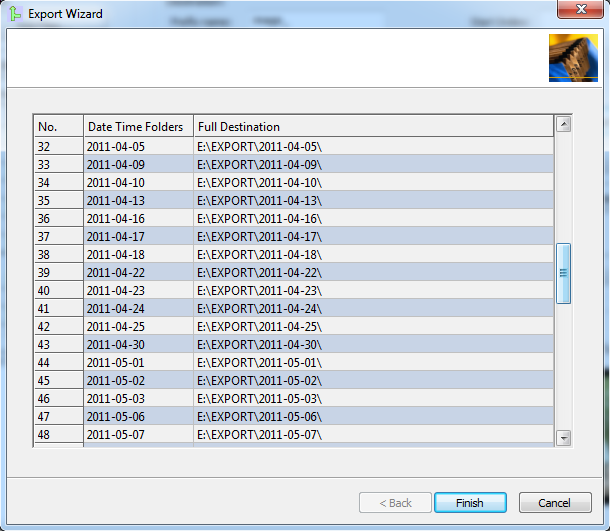 The Start Export button launched a new wizard dialog that allows the selection of the preferred export method. 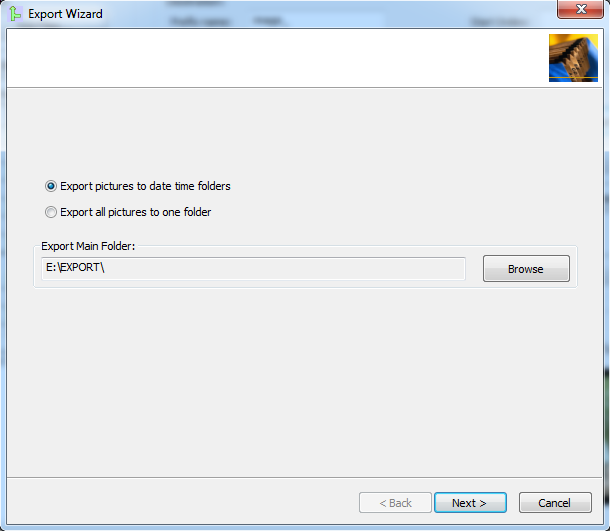 If the user chooses the default Export to date time folders the Export wizard window shows a list with detected time folders. Finally you have the result files in you desired folder. This application uses the camera’s internal time. Date and time are saved by the camera to the picture’s creation moment. But, because of camera’s settings, the time could differ from camera to camera and this could affect the application final results. For better and faster results I advice you to synchronize your camera time settings with your friends camera’s time settings. In the current version you can adjust individually the picture’s time using Picture creation time adjustment feature. In a next version I will add a general time scale option, too. The file format support will be extended, too. Pictures edited in non-professional application loose the EXIF data and in this case the affected files will be sorted by file name. Feel free to add comments, suggestions or bugs reports to this application. Any constructive feedback is sincerely appreciated. Many thanks for the application. I do find it very useful. 1. Why the main window is not sizable? 2. Can you add a tool tip description of what the fields and controls are suppose to do? 3. 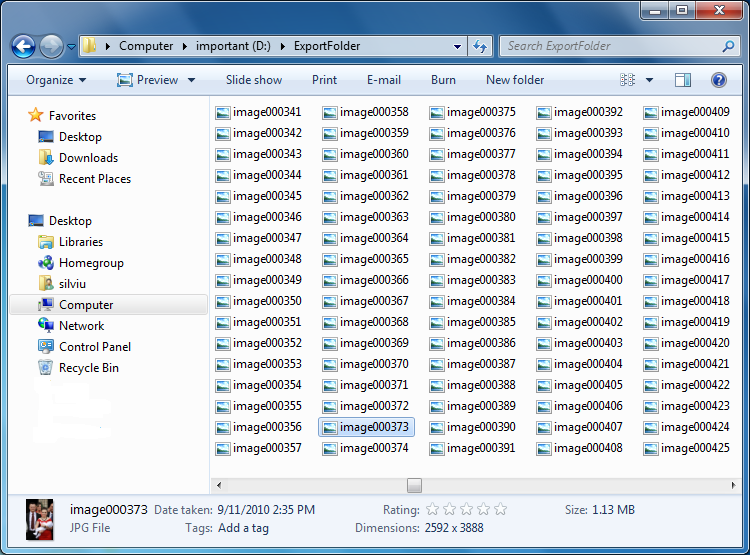 Can you add a grouping option over the destination folder, allowing to group pictures into folders based on one EXIF criteria (like date, time, ISO, orientation, etc.)? 1. Current application is a “simple” dialog type application and to be honest resizing feature has a low priority in my list. Is a feature that maybe I’ll add in the future or maybe the application architecture will change and then the resize functionality will be included. 2. Indeed, is a good idea. This tool tips could help the user in oder of understanding application’s features. 3. This feature is now noted in my to do list. This is a good app but i have a problem with folders organization. My storage space is big and i have pics folders all over the place. If you add a feature to search my hard drive and move those pictures to special folders will be so nice. Thanks!